PASS!!! He doesn't even come with all his weapons! Just the Z-Saber, Buster Gun, Triple Rod, and Shield Boomerang. Missing 3 weapons, the Zero Knuckle could of easily been made! More weapons than the Kotobukiya one though. But not proportioned like the Kotobukiya one. Hes stretched out! Surely going to PASS! 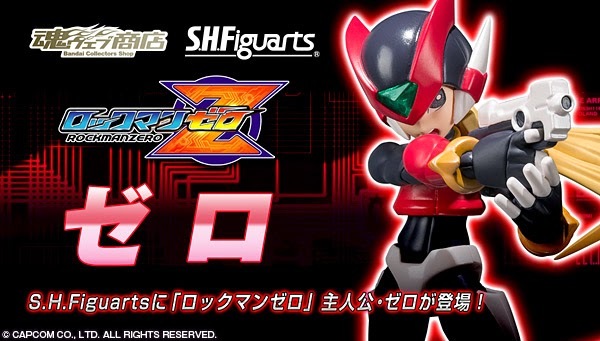 The Koto' one has a giant head that ruins the proportions of the model, and this one comes with all the weapons Zero had in the first MMZ game, I thinks that's enough for the price. Yeah it has a bigger head but its not stretched like this one! Compare the pictures of the Koto one and this one and tell me which one is more proportioned to original artwork or something? This one has been slimmed down and stretched. Yeah I know, it's like they shrunk his chest and stomach area, then to compensate they just stretched his limbs. With the Koto on it's the opposite, it's like they scaled the figure too small to detail, so they just grew the head two times the size. I'm starting to agree with Megafan, the Zero series can just never come out right from major figure lines, and is best left to individual craftsman at cons and stuff. This is a normal release right? It's not up at AmiAmi yet... or did I just totally miss it? It's a webshop exclusive that you can only get through bluefin, just like black zero. So it won't be on amiami or any other jap sites. I'm one of the few that own those Harvest-WKS Rockman X & Zero kits released several years ago. NOT the cheap recasts/reproductions, the actual original authentic kits that were sold in Japan (and I can prove it). Despite their size, the detail & designs are still excellent & I wish we would get larger versions of it. Zero even came included with all of his weapons (sans knuckle). Nevertheless, I'll still buy this Figuarts version, to support the line. Pre-Ordered! you've gotta admit that these figures are the best official figures we've had for the series, I just hope they continue the Mega Man line further, would love to see more in the future! This figure looks fantastic. I have no idea where these complaints about the proportions are coming from. Only thing this figure is lacking is the Chain Rod, then it's perfect.